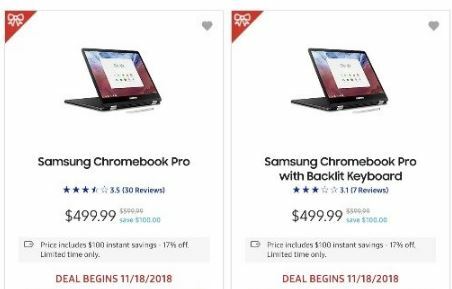 Find all of the best Chromebook Black Friday deals on a tablet or laptop computer during Black Friday 2019. 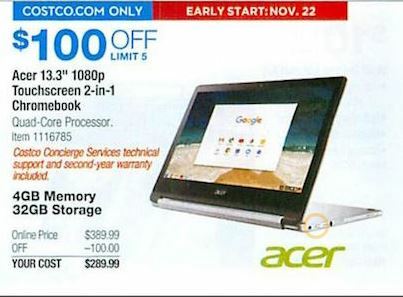 We have searched the ad offerings from store retailers and online websites for the biggest savings on table and laptop computers utilizing Chromebook from Thanksgiving Day to Cyber Monday 2019. 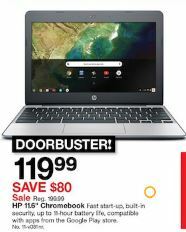 If you are looking for a new personal computer this year and your primary usage will be surfing the internet and word processing while online, consider buying a cheap Chromebook at a discount over Thanksgiving weekend. They also make great Christmas gifts for friends and family! Here is the list of brands that we will be looking for deals on during Black Friday 2019. 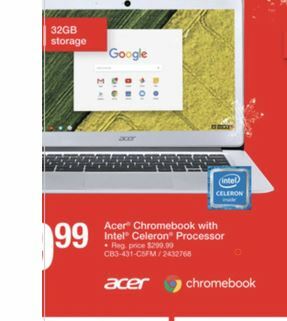 Acer – They make the Chromebook 11, Chromebook 14, and Chromebook R. Acer is a multinational hardware and electronics corporation with headquarters in Taiwan. They also make the Predator series of gaming computers. 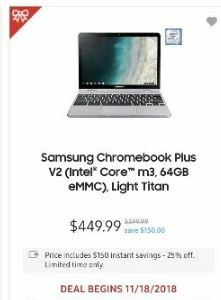 Samsung – They make the Samsung Chromebook 3, the Chromebook Plus, and the Chromebook Pro. The Pro and Plus are 12.3″ LED Display 2-in-1 laptop and tablet computers. 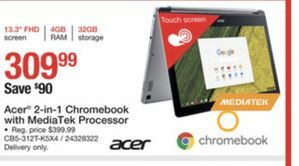 The Chromebook 3 is a 11.6″ LED Display with 4 GB of RAM and an Intel Celeron processor. Samsung is a consumer technology company making electronics and smart appliances headquartered in Seoul, South Korea. Asus – A Taiwan based multinational computer and electronics company that makes laptops for personal computers, gaming and eSports. The primary line of Asus Chromebooks is the Chromebook Flip series, which includes four different models with screens of between 10.1″ and 12.5″ featuring a 360-degree hinge to make it a laptop or tablet computer. 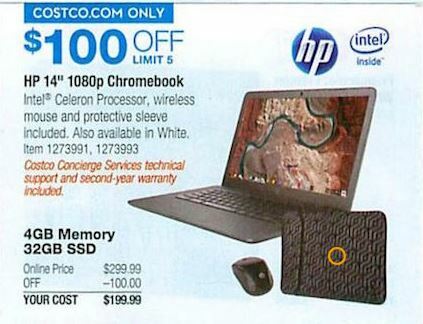 HP – Their primary products are the HP Chromebook 11 and HP Chromebook 14. They have made an extensive line of Chromebooks with screens between 11 and 14 inches. This should be no surprise as the company formerly known as Hewlett-Packard is one of the largest manufacturers of personal computers and electronics devices such as desktops, laptops and printers. 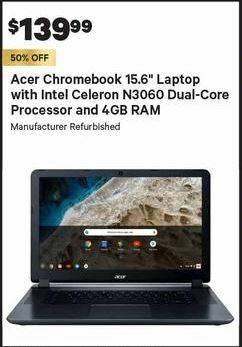 Click Here to check the latest Chromebook deals on Amazon. Amazon offers lightning deals and other sales for the entire month of November, starting on November 1st and going through Cyber Monday. Because of the sheer number of discounts they offer and the short time span of some of the sales, we encourage you to visit Amazon yourself via the link above to keep up with the current savings offered. 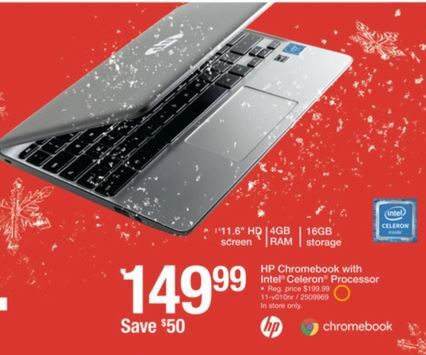 They have an excellent selection of Chromebooks by HP, Samsung, Acer and Asus this year. 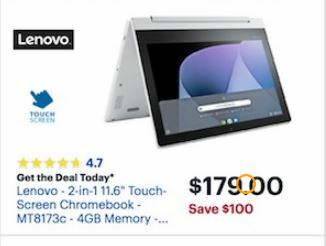 Amazon has its Chromebook sale as a Deal of the Day. 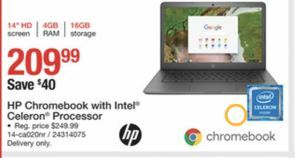 Click Here to Save Big on Your Chromebook Purchase. Includes Intel Celeron processor, Google Chrome OS, 4GB memory, 32 GB storage and 11.6″ HD display. 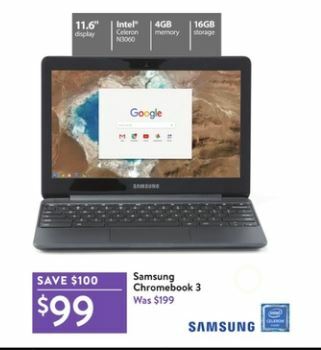 Click Here to find the Samsung Chromebook deals. Find the Walmart deals here. 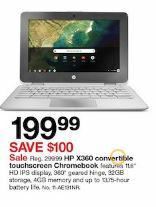 Find the Samsung Chromebook at Best Buy here. 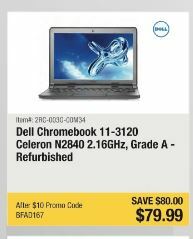 Shop Newegg here to find the above products. A Chromebook is a laptop running the Linux-based Chrome operating system. It is designed to be used with Most applications and data reside on the cloud, with internet browsing happening through the Google Chrome web browser. The device also has support for USB devices including external keyboards, flash drives, cameras and a mouse. Students are one of the largest users of Chromebooks, with first-time computer users and households needing an additional computer also on the list of prime users. 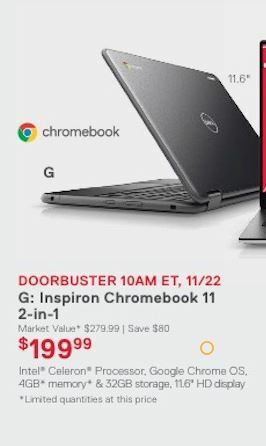 Why buy a Chromebook? 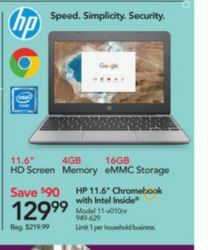 They usually offer a lighter laptop at a lower price then traditional laptop computers in exchange for an internet-based experience through the Chrome browser and operating system. We have gathered an extensive collection of ads and sales on electronics products for Black Friday and Cyber Monday in 2019. Stop back to see more desktop computers, laptops and tablets added over Thanksgiving Weekend through Cyber Monday.